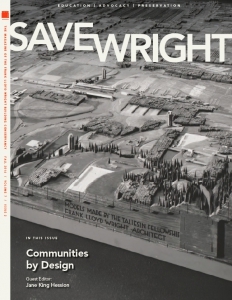 SaveWright is the Conservancy’s biannual print magazine covering a variety of scholarly and practical topics of interest to academics, building owners and a general audience of Wright enthusiasts. Each issue is organized around a central theme. Past themes have included restoring Wright houses, incorporating green technology into Wright buildings, Wright’s work in Japan, interior design and furniture. 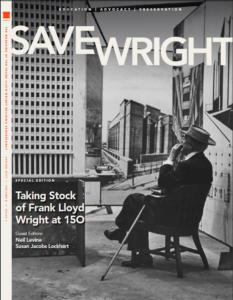 The print edition of SaveWright is mailed to all active Conservancy members each spring and fall. The full electronic edition is available to members only, but a five-page preview may be viewed by all. Back issues of SaveWright and the Conservancy’s earlier Bulletin publications are available for purchase by returning this downloadable order form. Carry SaveWright in your gift shop or book store! Bulk discounts and single-issue orders are available. Click to download the order form or contact us for more information. "Formative connections guaranteed that Wright would be extremely interested in education throughout his life," writes guest editor Dale Allen Gyure. "This aspect of his career, however, isn’t as well-known as some of his other endeavors. 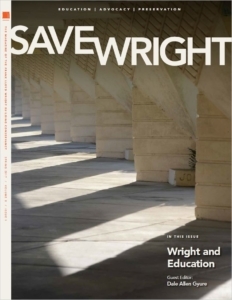 The essays in this issue of SaveWright explore new avenues of interpreting Wright’s architectural projects for education, focusing on built work—from the elementary school level to Florida Southern College—unbuilt proposals, and comparisons with other educational communities and theorists in an attempt to better understand how his educational history and philosophy manifested itself in his designs." This issue includes six articles touching on the theme of community in Wright's work. "Communities can take many forms and mean different things to different people," writes SaveWright guest editor Jane King Hession. "The whole of a community comprises its parts. Frank Lloyd Wright was no stranger to this concept: for decades he lived and worked at the center of the Taliesin Fellowship, a community of his own creation. However, as the essays in this issue make clear, Wright also explored the idea of community—at multiple scales—in his architecture and planning." Frank Lloyd Wright’s groundbreaking designs, innovative construction techniques and inviting interiors continue to astound and inspire generations of architects and nonarchitects alike. 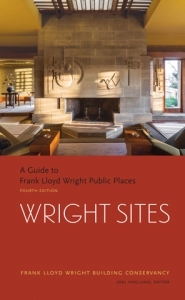 The only comprehensive collection of Wright-designed buildings open to the public in the United States and Japan, Wright Sites has been revised and expanded for release May 2, 2017, to celebrate the 150th anniversary of the architect’s birth in June 1867. The fourth edition of the Conservancy’s best-selling guidebook contains 20 new sites, updated site descriptions and access information, itineraries for Wright road trips, and, for the first time, all color photographs. 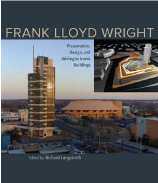 Past Frank Lloyd Wright Building Conservancy board president Richard Longstreth, director of the graduate program in historic preservation at George Washington University, edited a selection of papers presented over three days at the Conservancy’s 2010 Cincinnati conference into the first major publication to address the issue of adding on to Wright buildings. Contributors include de Teel Patterson Tiller, Sidney K. Robinson, Anne Biebel and Mary Keiran Murphy, Mark Hertzberg, Dale Allen Gyure, Neil Levine, Scott W. Perkins, Tom Kubala , Eric Jackson-Forsberg, Lynda S. Waggoner, Patrick J. Mahoney and Thomas Templeton Taylor.